Where is Grandpa? This question haunts a young boy on the day his grandpa dies. Grandpa has been so richly present in so many places--at the tree house, at the waterfall, at the door ready to carve pumpkins. But where is he now? As the boy searches for an answer, he makes a surprising discovery: perhaps Grandpa is closer to home than anyone ever realized. 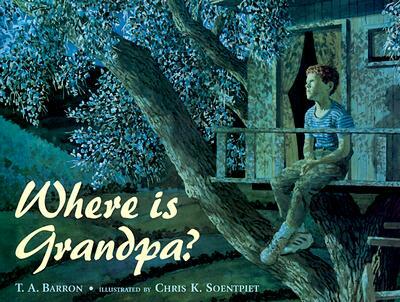 In this deeply moving tale, the poetic words of T. A. Barron and the luminous illustrations of Chris K. Soentpiet remind us all that a family's sorrow can be shared--and that even in the greatest loss, love can still be found.